Situated on the outskirts of Gurgaon or Gurugram the Heritage transport museum has a different story to tell. From pre-mechanised palanquins to heavy trucks spanning all the way from vintage vehicle advertisements to classic 1924 Ford-vehicles, every wall, every floor, and every single display is handpicked in the Museum. This Indian heritage-on-wheels is superbly displayed to help one explore, understand, admire and appreciate the known and unknown facts of India’s tryst with its roads. It is India’s first comprehensive transport museum located close to Delhi & Gurgaon. Here are some more interesting things about the Heritage transport museum. Heritage Transport museum is a mellifluous saga beginning with the invention of the wheel, followed by a step-by-step advancement through howdahs, bullock-carts, horse-carriages, bicycles, mopeds, scooters, phat-phat and a lot more. It has over 75 vintage and classic cars to trucks, buses, vans and popular models of locomotives. Suspended mid-air in the galley is a 1940s Piper J3C Cub aircraft with its signature chrome yellow. Their entire collection focuses exclusively on Indian Transportation history. These collection items are unique, rare and one-of-a-kind. There is also a section showcasing wooden and tin toys, pedi-cycles long with two art galleries depicting tribal and contemporary art-forms within its premises. The world-class transport museum showcases different modes of transportations used in historical times. There you will find a fusion of contemporary art with historical objects. The museum is an outstanding example of creativity and aesthetic sense which has been completely imagined and designed focusing to provide the visitors with an enjoyable and engaging experience. 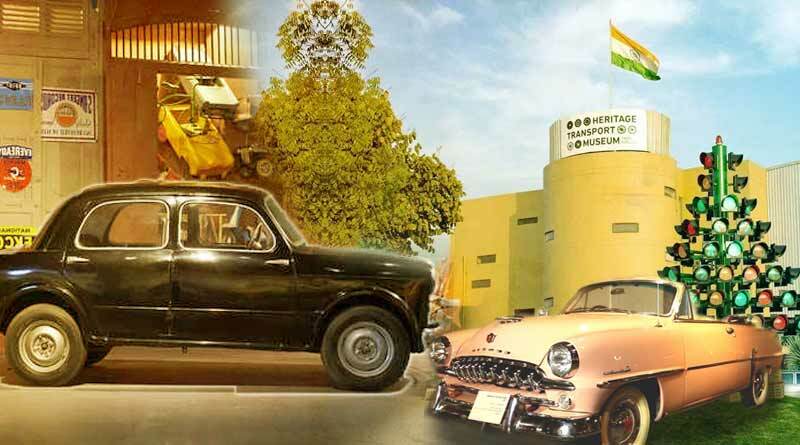 While remaining true to the ethics of a transport museum, the Heritage Transport Museum presents a snapshot of Indian heritage but with a modern twist! It offers an interactive tour with well-read guides and customized activities to suit every age group. There is also an option for one on one interaction with the museum curator which has to be scheduled before the visit. There are few more fascinating facts about the place: It sprawls across four-levels. There is a restaurant within to appease your taste buds when you are tired after your transport tour. For children who are below three years of age and disabled persons, the entry is free. Timings: 10:00 a.m. to 07:00 p.m.